This is a story of flying lessons, both literal and figurative. The story begins with Nellie Zabel, who took flying lessons in a literal plane. She then became the first deaf woman to earn a pilot’s license in 1928. 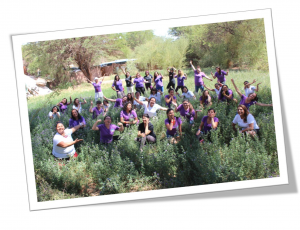 Then the story ends with a group of emerging Deaf women leaders in Chile. They take metaphorical flying lessons to learn leadership skills. Except, it doesn’t end there. A new beginning starts there, as the women return home and use the leadership skills they learned. To advocate for better laws for Deaf women. To be better leaders for Deaf women. To advocate for removing barriers and boundaries. So that nothing can stop them from taking flight to a destiny that they define for themselves. The Nellie Zabel Foundation (FNZ) in Chile, named after the first deaf woman pilot, is one of Mill Neck International’s (MNI) project partners in its 2018-2019 project funding cycle. FNZ’s project is called “Flight Lessons: Pioneers of the Deaf Community.” As part of this, they launched a training program for Deaf women leaders. In this initiative, they partnered with another organization in Chile, Wenüi. Wenüi is a cross-disability organization that promotes accessibility for people with disabilities. As a result, FNZ held their first Leadership School for Deaf Women in January this year. The graduating leaders from the first school plan to replicate their training with more Deaf women in 15 regions all across Chile. As a result, FNZ expects growing numbers of Deaf women leaders to participate in all areas of social development for their country. 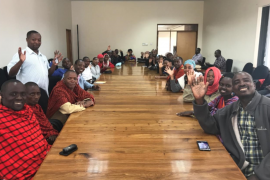 On the request of the Nellie Zabel Foundation, Mill Neck International’s (MNI) Planning Monitoring and Evaluation (PME) Specialist Sarah Houge timed her monitoring visit to coincide with their first Leadership School for Deaf Women. Also on FNZ’s invitation, Sarah led some workshops during the school. Additionally, she visited the Wenüi office and other stakeholders in Antofagasta. During the Leadership School, participants learned about advocacy in politics and legislation. Furthermore, they learned about the Convention on the Rights of Persons with Disabilities. Additional topics included using media to present information, women’s health, and gender-based violence. The majority of presenters were Deaf Women. The presenters also came from multiple countries including the United States and Argentina. As a result, participants were able to network among contacts who might not normally be easily available. One crucial session during the training program focused on diversity and on indigenous peoples. For some participants, it was the first time they had been exposed to this topic. Some participants were themselves indigenous women. As a result, one participant said she is now determined to look for other Deaf Indigenous Women in Chile and elsewhere in South America. Her goal is to form a network so that Deaf Indigenous Women can support each other. She also hopes for them to learn about their history and advocate for change. Another participant has now created a series of videos to educate Deaf Chilean women about HIV/AIDS. The videos are all in Chilean Sign Language with Spanish captions. The first leadership training program is done. But FNZ’s work, and the work of the 15 participants, is only beginning. Already they have plans to develop flyers and other materials for parents of Deaf children. They will disseminate these at hospitals and clinics in local communities. FNZ is building an ongoing relationship with the 15 Deaf women leaders as they begin to train other Deaf Women in leadership skills. Meanwhile, MNI is also continuing to strengthen its relationship with FNZ. In other words MNI works with Nellie Zabel Foundation to see what horizons they fly across next.